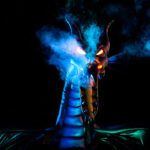 Tags: Disney Parks, Disneyland, Disneyland Resort, Fantasmic! The day after the D23 Expo, Disneyland celebrated its 62nd birthday. The crowds were heavy as everyone gathered in front of the Main Street Train Station for a special moment. The Disneyland Band, the Dapper Dans, and cast members representing the entire park were joined by 62 Disney characters for a special birthday moment. Walt’s opening day speech was played, and then the assembled sang “Happy Birthday” to Disneyland. Later that evening, the Rivers of America were re-ignited as Fantasmic! returned for its 25th anniversary. While the show had soft-opened for guests of the D23 Expo, the grand return was set for the park’s birthday. Before the show, the Disneyland Resort Ambassadors appeared on a Tom Sawyer’s Island Raft to once again lead a birthday sing-along. The thrilling spectacle of Fantasmic! has been updated during its hiatus. With new animation, technology, choreography, and effects, the show is a new experience into the world of Mickey’s imagination. Doug Marsh had the opportunity to speak with Disneyland’s Director of Creative Development and Production David L. Duffy about the show. What do you think of the new show? You can catch Fantasmic! nightly at the Disneyland Resort throughout the summer and beyond. 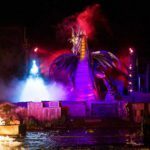 Disneyland Announces Soft Opening Performances of Fantasmic! 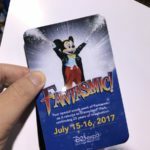 Disneyland Highlights Changes to Fantasmic!